We have just the sweet thing to bring the romance of Paris to your front door. These Parisian themed Personalized Lollipop Favors come complete with Eiffel tower imagery. And though they look almost too pretty to eat, guests ready to dive in are definitely in for a tasty candy treat. A classic white satin bow and clear-cellophane wrap around each lollipop favor add just the right finishing touch. 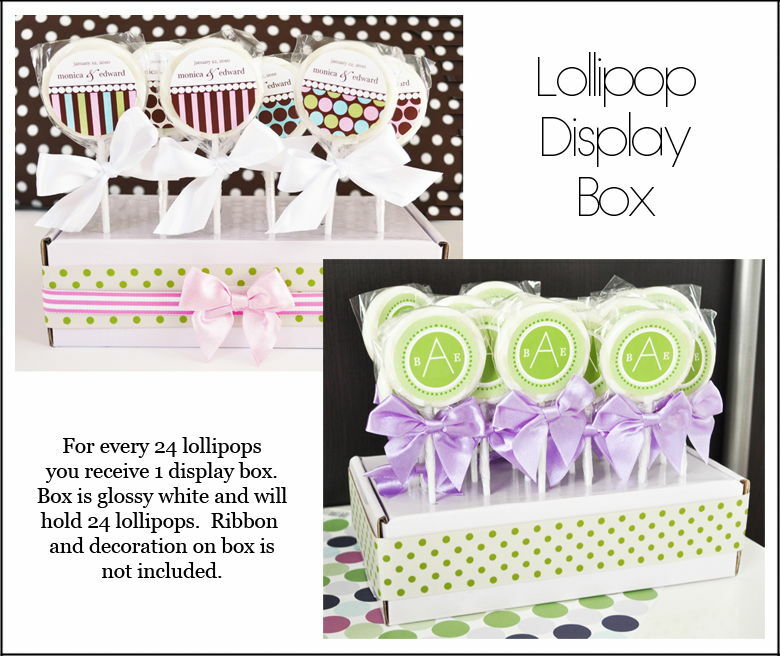 For every 24 lollipops, you will also receive the perfect matching Display Box to showcase them standing up, making for an ultra-chic event accessory. Personalized labels are included and add the finishing touch for a special gift to your guest. Be extra creative by bundling 5 or more together with a bow (like a bouquet) in a small vase. Lollipops arrive separate from the labels. Some assembly required (attaching the self-stick labels to the lollipop wrapper). Each lollipop is white and ivory-swirled in color. Size: Diameter: 2.5". Length: 7 3/8"